Tiger Brook Park was purchased with the assistance of the New Jersey Green Acres Program in 1980. This 270-acre preserve contains a ten acre reservoir. The Park is located on Cooper Lane, 1/4 mile east of Route 206. A parking lot is located immediately adjacent to Cooper Lane, and provides access to the preserve’s service road and to a system of trails within the park. The MacGregor Preserve is adjacent to the Township’s existing Tiger Brook Park and together, the two parks provide 430 acres of contiguous open space. Peapack Brook, a major tributary of the North Branch of the Raritan River and a state classified Trout Production stream flows through the park. MacGregor Preserve consists of 159.5 mostly wooded acres on Old Chester-Gladstone Road. The property was purchased in January 2001 for $3.2 million from the Estate of Samuel C. MacGregor. 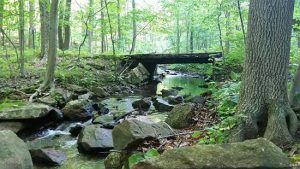 This property was purchased through the combination of a Morris County Open Space Trust Fund grant, a grant from the State Green Acres Program, and money from the Township Open Space Trust Fund. Hiking trails connect the MacGregor Preserve with Tiger Brook Park. 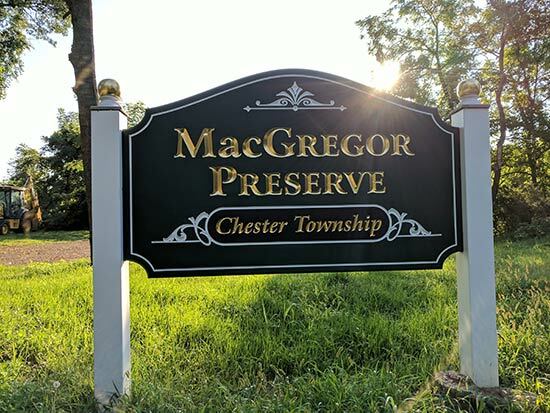 The entrance to MacGregor Preserve is located on Old Chester-Gladstone Road, just south of Route 206 where a gravel parking area for 8 cars is provided. Note: This is a hunting area, dates posted at entrances. A lovely trail through streams and forest and old ruins, it is quite overgrown for approximately 0.5 mile west of the old stone ruins and ATT corridor, but is very passable by early winter. There are two potentially difficult stream crossings in high water conditions. The Blue Trail begins 0.2 miles along the Purple Trail from a T-junction at the southern edge of the pond: the Trail descends to a brook, turns left along the shore for 0.2 mile, then turns right to cross a stream on rocks (difficult crossing in high water). It ascends 250' and just before the wide ATT corridor turns right (almost a U-turn) to follow the stream bed upstream. It crosses the AT&T corridor again at 0.5 mile and continues its gradual ascent. At 0.8 mile it levels off and shortly reaches the northern edge of a field on the right, turns right to follow the edge of a field uphill (straight ahead the Trail leads in 0.2 mile to the MacGregor Preserve parking lot on Old Chester-Gladstone Road). At 1.1 miles the Trail turns right off and reenters the forest, now on a wide path descending steadily (at this junction, walking around the edge of the field leads back to the parking lot in 0.2 mile). At 1.4 miles it passes a stone ruin “old cabin and picnic area” on the right, then goes downhill to a third junction with the AT&T corridor at 1.5 miles. The Trail turns right briefly before turning left into the woods – this section is quite overgrown in foliage season. After a short boardwalk section at 1.7 miles, the Trail crosses an unnamed brook which follows upstream through a rocky overgrown section -- this is the old sawmlll area. The Trail clears at 1.9 miles, before turning right on a plank bridge over a stream at 2 miles (caution: some planks are loose or missing – only for experienced hikers), meets the Green Trail entering from the right at a “Y” junction, and ends in a clearing at 2.1 mile. The Green Trail is a U loop with both ends on the Purple Trail; as of this writing, neither trail junction is blazed from the Purple Trail. Starting from the parking area gate, the first junction with the Green loop starts in 200 feet at the far edge of a small field to the right. It descends and crosses the Red Trail at 0.2 mile, continues its descent through a thorny, overgrown section and reaches the beginning of the Blue Trail at 0.4 mile. In another 300 feet, it reaches a Y-junction and angles left while the Blue Trail continues to the right. The Trail briefly meets the brook shore, crosses the Red Trail which follows left for a few yards, and then right to continue to a junction with the Purple Trail at 0.8 mile, 0.5 mile downhill from the entrance gate on the Purple Trail. his is a loop trail that is quite overgrown in its eastern section but completely passable by early winter. The Red Trail crosses the Purple Trail entrance road at the entrance gate; turning left, it descends on the broad AT&T corridor and then turns right in 0.1 mile (this section may be impassable during growth season, so an alternative is to continue straight to Cooper Lane and turn right until just before the brook crossing, to rejoin the Red Trail). At 0.2 mile a short boardwalk section leads almost to Cooper Lane, then U-turns south to cross a bridge over a stream at 0.3 mile. The Trail veers away from the road, passes the White Trail northern junction on the left at 0.4 mile and descends, now a broad woods road. The Trail reaches the northern edge of the pond at 0.8 mile, crosses a broad grassy corridor, and then a narrow path through brambles to cross the pond inlet, then the grassy shore of the pond, reaching a junction with the White Trail southern junction at 0.9 mile. Continuing to the edge of the pond, the trail turns right on a gravel road and right again over the pond outlet on an intersecting gravel road. In 300 feet, the trail turns left and ascends, crossing the Green Trail at 1.5 miles and shortly reaches a T-junction with the Yellow Trail AT&T corridor. Turning right, the Trail returns to the Purple entrance road to complete the loop at 1.75 miles. The Trail begins at the Cooper Lane parking lot gate and descends on the gravel road. At 1.1 miles it reaches a pond on the left and the Red Trail junction on right, then is co-blazed with the Red Trail until a T-junction with another gravel road, crossing an outlet to a brook. The Purple Trail turns right to end at 1.4 miles at the junction with the Blue Trail, just before old water tanks located straight ahead. The southern trailhead starts off the Red Trail opposite the pond dam. Although blazes may be difficult to follow initially, the White Trail tracks the stream for the first 0.2 mile, then crosses a plank over a stream, through a large blowdown section, and then ascends the hill in open forest until the crest at 0.4 mile. Now on a woods road, it descends to its terminus on the Red Trail at 0.6 mile. The Yellow Trail follows the wide AT&T right of way corridor along the western border of the park. Beginning at the entrance gate/Purple Trail at the Cooper Lane parking lot, the Trail turns right and passes the Red Trail junction on the left at 0.1 mile, after which it curves left and descends to a brook crossing (difficult in high water) at 0.4 mile. Then there’s a steep ascent to the edge of the property followed by a descent to the Blue Trail junction at 0.7 mile. The Blue Trail turns right here, and also is co-blazed straight ahead with the Yellow Trail for the next 300 feet. After the Blue Trail leaves to the left, the Yellow Trail descends and crosses the Blue Trail again at 0.9 mile, continuing downhill to its terminus with the final junction of the Blue Trail at 1 mile.